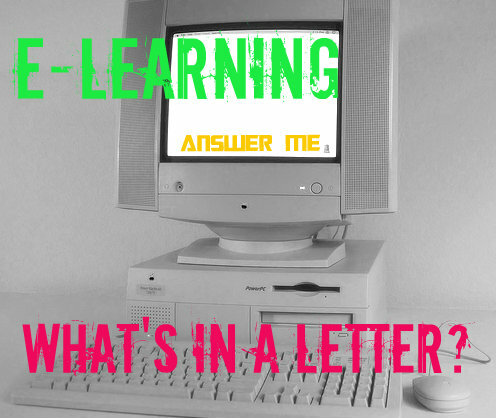 E-Learning: What’s In A Letter? Our recent post on our predictions for EdTech in 2014 generated some thought-provoking comments and responses. One comment in particular got us thinking about some of the assumptions that are widely made when talking about EdTech, language learning and the various opinions and developments that feed into them. Paul Emmerson raised the point that the ‘e’ in elearning merely refers to the medium through which the content is delivered and that actual learning is an immutable activity that requires the same amount of effort and application regardless of how it is approached. Just because the materials and activities are expressed in binary code or are files saved in the cloud it doesn’t change the responsibility or necessity of the human effort that needs to be leveraged to attain the desired outcome. The ease and speed of accessing the material shouldn’t be misinterpreted as reflecting the ease and speed of actually learning what there is to learn. Consider ebooks versus their ‘tree-ware’ counterparts; the content is flowable text that is unrestrained by the bulky physicality of pages and dust jackets. It is searchable and there may even be a dictionary application that is available at the prod of an inquisitive finger. But, you still need to read each and every word if you want to fully enjoy the author’s work. There’s no avoiding that. Undoubtedly, the use of online platforms and mobile apps requires new methodologies to express and best apply the different forms and levels of interaction that are being promoted (how you read on screen differs greatly to how you read ‘on page’, scaffolding and concept checking in the absence of a live teacher become critical, etc. ), but we can’t ignore the human brain that is being given the opportunity to engage with a learning opportunity. ‘E-dependant learning’ might be a more accurate term for what is currently described a e-learning. Thanks for picking up on my earlier post. 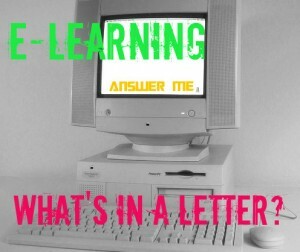 On reflection, I think the issue is this: eLearning is actually not eLearning at all. It’s eTeaching. Or eDelivery OfMaterials to be exact. Learning may or may not take place. The learning that does take place may be different to the intended learning. The learning may be forgotten. The website/app/video/slide/podcast/pdf provide materials in an easily accessible way. That’s great. But then it’s down to you, the user, to actually do the learning. The point from my original post that you didn’t pick up is how this plays out in terms of eLearning selling itself in the marketplace. By using the word ‘learning’ in the product the customer feels that they are buying learning by buying the product. It’s a sleight of hand. The hard work involved is quietly ignored. High motivation is enough. In my post I drew a parallel with gyms and fitness centres: sign up, get access to our great equipment whenever you want it, and you’ll easily get fit and lose weight. Well … most people who sign up don’t get fit on a sustained basis. They go a couple of times full of good intentions and then drop out (just like with MOOCs); they lose a little weight but then put it back on; they realize that getting fit is actually much harder and requires much more long-term effort than they initially thought. Other people do get fit – it’s not a complete fraud. But the fitness centre is offering you the chance to get fit, if you put in the time and work, not fitness itself ready-made. I think this is more understood for fitness centres than it is for eLearning. By the way, Quora has many interesting discussions that are relevant here. Type MOOC into their on-site search engine to see some. Below I’ve pasted a link to one where an associate professor at a large university points out that municipal libraries are full of MOOCs, in a previous format – books. There are other interesting comments. Paul, you have made a very valuable point. I wonder where things would now stand now if in the beginning all this e-stuff had been called the more neutral and more accurate estudy not elearning?